Wopila (Thank You) for visiting our new site. Be sure to check back often as new content will be added frequently. Please visit our DONATE page to learn how you can help us sustain this valuable program on the Rosebud Indian Reservation. 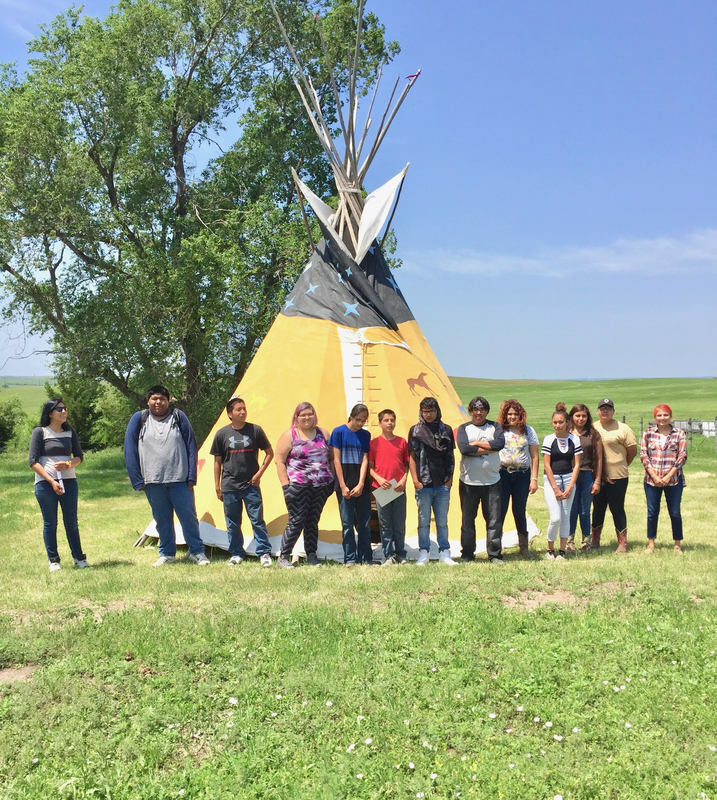 ​SGU Tiwahe Glu Kini Pi (TGKP) “Bringing the Family Back to Life” and the SGU Science Department offered a two week STEM/Horse Camp on June 4th – 15nd for High School students, ages 14 through 18. 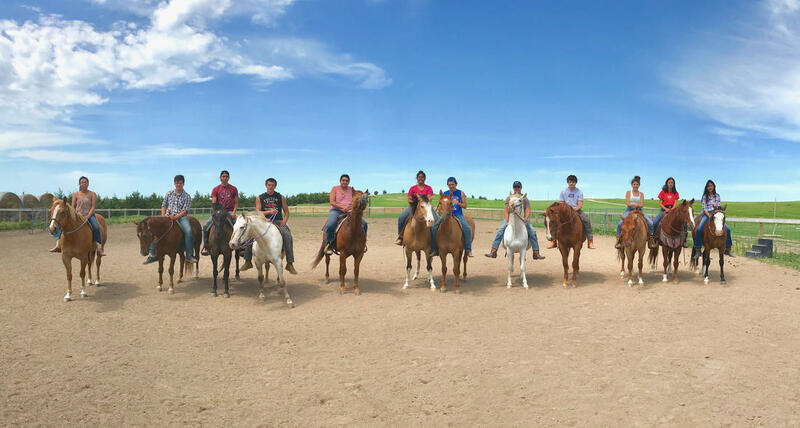 Throughout this two week camp, students spent their mornings learning how to care for, ride and interact culturally with our Sunkawakan Oyate (Horse Nation) at the SGU Horse Ranch while also gaining knowledge and experience with Lakota language and values. Camp highlights include: helping horse handlers set up a tipi, individual spirit connections with the Sunkawakan, painting a model wooden horse to take home, and horse rides almost every day around the SGU Horse Ranch! In the afternoons, camp attendees headed to the SGU Tech building where they were introduced to the different fields of STEM: Science, Technology, Engineering, and Mathematics, where they designed and completed their own research projects. These included making: a Simple Paper Coffee Cup Helicopter; a bridge able to withstand the weight of a 145 lb. person made from popsicle sticks; a functioning recycled boat; and an active Volcano. The end of the two week Stem Horse Handler Camp concluded with a horse riding exhibition, a cookout and presentation of their research projects for family and relatives. For more information on future 2018 Summer Sunkawakan Camps, please contact: Kateri Douville at 605-856-8163. A Family Camp for Parents/ Guardians and Children, ages 10-14, will be held on July 9-12. A Girls Camp for ages 8-16 will be held on July 31-August 3. A Boys Camp for ages 8-12 will be held on August 7-10. Applications can be picked up at the TGKP office on the SGU Antelope Lake Campus in Mission, SD. 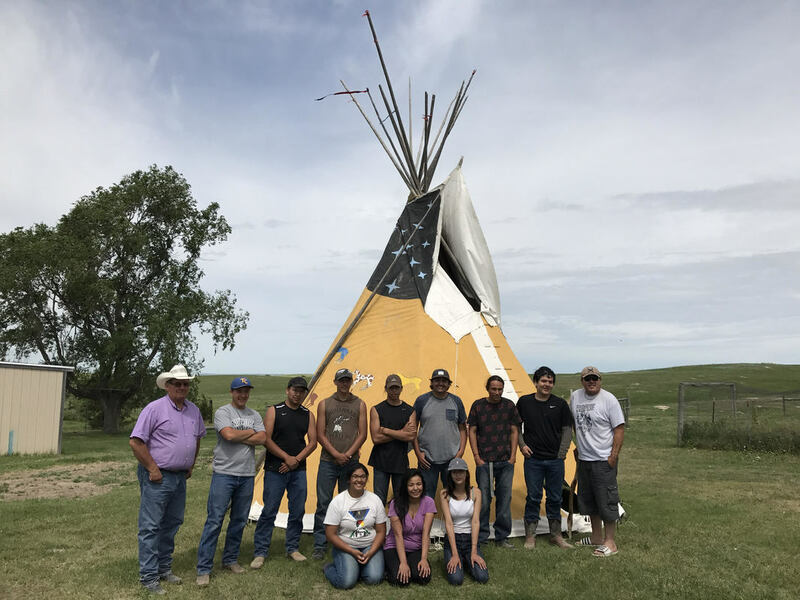 ​Another successful camp ended this past week for Tiwahe Glu Kini Pi “Bringing the Family Back to Life” at the SGU Horse Ranch. 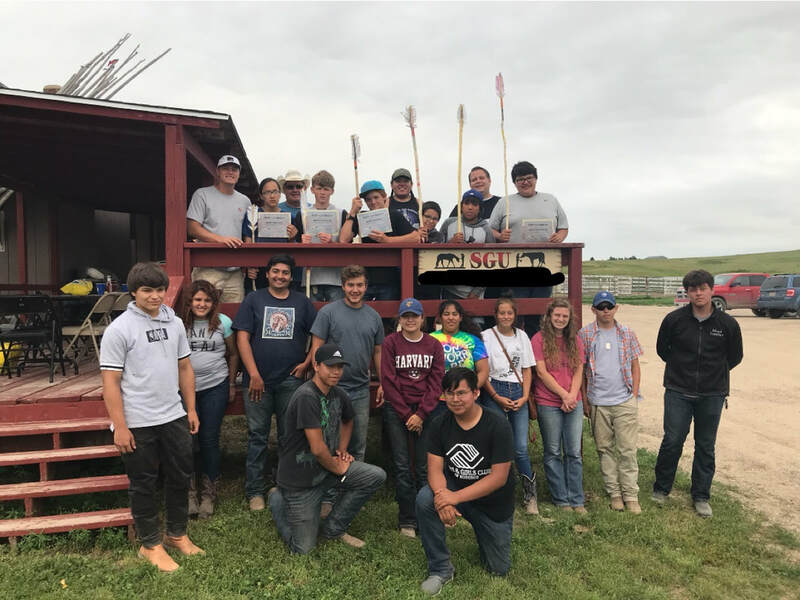 This camp was for a group of young men, Most Valuable Players, ages 12– 17, who spent time connecting with the Sunkawakan Oyate (Horse Nation) learning about safety, care of horses and riding. They also learned about the roles of a young man and the values he should carry including respect for all of creation. Highlights of the camp include the young men whittling and painting their own lances, learning how to throw their lances, picking sage, gathering wood and learning how to use a wood splitter! The young men ended the week with a long horse ride to town to get ice cream at the Starlite Drive-In and a cookout and completion ceremony with their families afterward. Partners assisting Tiwahe Glu Kini Pi (TGKP) staff with the camp included Gunner Krogman and Lucas Iron Heart of WBCWS/Most Valuable Players Program (MVP); REDCO Food Sovereignty Initiative, who provided a traditional meal; TGKP Horse Handlers who mentored riders and insured safety; and Duane Hollow Horn Bear who assisted with Lakota Cultural teachings, language and stories. For more information on remaining 2018 TGKP Summer Sunkawakan Camps, please contact: Kateri Douville at 605-856-8163. A Girls Camp for ages 8-16 will be held on July 31-August 3. A Boys Camp for ages 8-12 will be held on August 7-10. Applications can be picked up at the TGKP office on the SGU Antelope Lake Campus in Mission, SD. 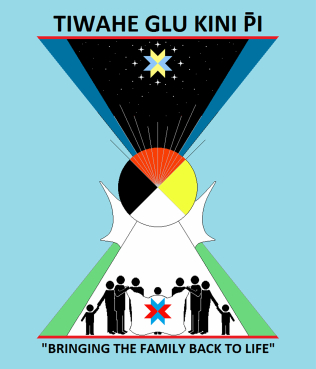 ​SGU Tiwahe Glu Kini Pi “Binging the Family Back to Life” finished another summer camp this past week. Twenty-one Wicincila’s, between the ages of 8 and 16, spent time with TGKP staff learning the importance of cultural values and relationship with the Sunkawakan Oyate. It was a fun week with a lot of activities that taught the girls cultural competency and respect for others as well as respect for themselves. The camp ended with a horse riding exhibit and a cookout with family. We would like to thank three Otterbein University Equine Science student interns who assisted throughout the week; the REDCO Food Sovereignty Initiative for a delicious Traditional meal and program presentation; Ron Frederick of SDSU 4-H for teachings on safety and care of horses, the White Buffalo Calf Woman Society for transportation and helping older girls sew sweat dresses at Her House, and community members who helped younger girls sew dresses at the TGKP “Our Happy Place” Craft Center. Last but not least we say Wopila to the Sunkawakan Oyate and the TGKP Ranch staff and Horse handler for a great camp experience. The final TGKP Summer Sunkawakan Camp will be held this week for Hoksila, ages, 8-12. For more information on TGKP, please contact the office at 856-8163. ​Our last summer horse camp ended this past week for SGUTiwahe Glu Kini Pi “Bringing the Family Back to Life” at the SGU Horse Ranch. 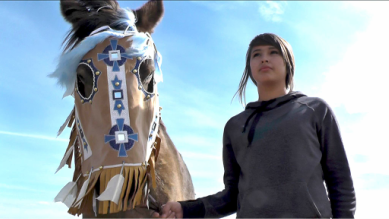 This week, Hoksila ages 8 – 12, spent time connecting with the Sunkawakan Oyate (Horse Nation) learning about safety and care. They also learned about the roles of a young man, the values he should carry including respect for all things and the proper use of a Nila (knife). Highlights of the camp include horse rides and making and painting their own lances! At the end of the week the young men were able to show family members how well they could throw their lances and ride their horses! For more information about the TGK Program, please contact: Kateri Douville at 605-856-8163. ​Another successful camp ended this past week for SGU Tiwahe Glu Kini Pi “Bringing the Family Back to Life” at the SGU Horse Ranch. 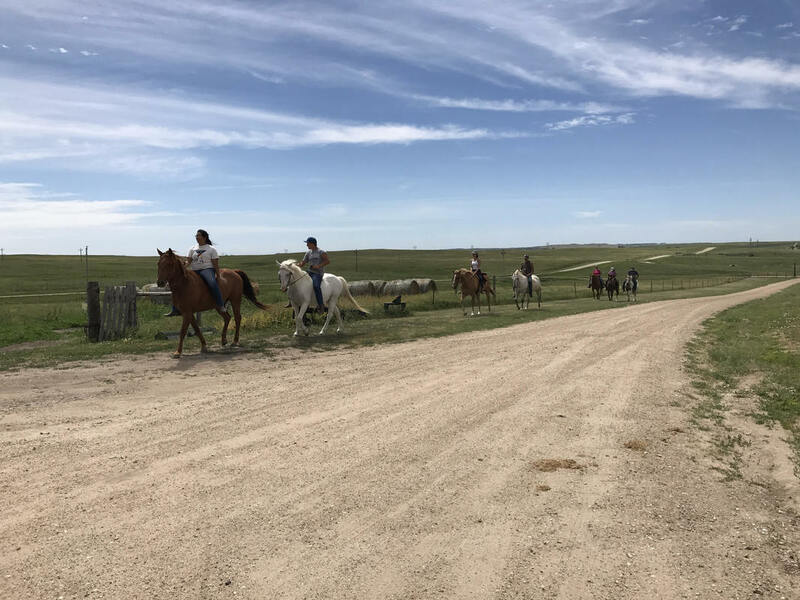 A group of young men and women spent time connecting with the Sunka Wakan Oyate (Horse Nation) learning about safety and care of horses, Lakota language, history and values during our 2018 Horse Handler Training Camp. Horse Handlers also learned about serious emotional, behavioral and spiritual issues that youth bring to TGKP for healing. Assisting TGKP staff with presentations were Ron Frederick, SDSU 4-H; Clarissa Cigrand, UC Greeley Doctoral Intern, Dee Curtis, USD Doctoral Intern; Wayne and Alexis Romero Frederick, Lakota ranchers. White Buffalo Calf Woman Society assisted with transportation and REDCO Food Sovereignty Initiative provided a traditional meal on the 4rd day of the camp. Highlights of the camp include riding and making spirit connections with the horses, learning how to care for the horses, and getting to know the new Horse Handlers. The week ended with a cookout for families, provided by WBCWS, completion certificates, and more horse riding! These awesome young men and woman really made the week special. We can’t wait to work with them throughout the summer! For more information and applications for future camps, please contact: Kateri Douville @ 605-856-8163 or Marlies White Hat @ 605-856-8203. SGU Tiwahe Glu Kini Pi (TGKP) “Bringing the Family Back to Life” offered a one week Horse Handler Training Camp on June 12-16, 2017 for 10 youth, ages 15-21. Horse Handlers were trained to assist TGKP therapists with Equine Assisted Mental Health Therapy and also with TGKP Sunka Wakan Youth Camps this summer. Highlights of the camp included a visit by a volunteer Veterinarian who gave the horses physicals, floated their teeth and brought immunizations up to date. Horse Handler trainees assisted the vet. The next day, a Farrier trimmed horse’s hooves with assistance of Horse Handler trainees. Earlier in the week, Sam High Crane shared teachings on Mitakuye Oyasin and the healing gifts and special relationship of the Sunka Wakan Oyate with the Lakota. Each trainee then participated in a Spirit connection with a horse. 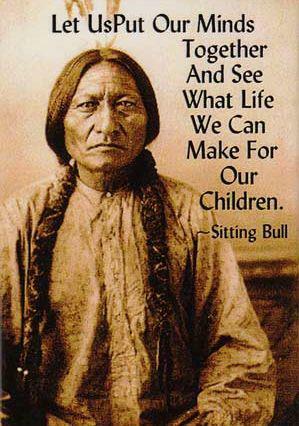 Greg Grey Cloud provided teachings on values and walked youth through the set-up of the Tipestola. Ron Frederick and Genna Buettner, SDSU Extension and 4-H, instructed trainees about horse safety, nutrition, anatomy, horse health, first aid and proper use of tack. The week concluded with a trail ride to Turtle Creek and a cookout with certificates of completion of training awarded. TGKP also partnered with the SGU Science Department to provide morning sessions with Horse Handler Camp for participants in their STEM Camps (Science, Technology, Engineering and Math.) Middle School students participated in the morning at the SGU Ranch and in the afternoon STEM classes were offered at the SGU Tech Building. The STEM/Horse Camp will continue for one more week and will conclude with student research presentations on Thursday June 22nd. A second session of STEM camp will be held from June27 through July 7 for Middle School and High School Students. For more information or applications for STEM Camp, please contact Mikel Bordeaux at 605-319-0035. Marlies White Hat at 605-856-8203 or Dave Valandra at 605-682-1823. Applications can be picked up at the TGKP Office on the SGU Campus in Mission, SD or mailed to you by calling Kateri at 605-856-8163. SGU Tiwahe Glu Kini Pi (TGKP) “Bringing the Family Back to Life” and the SGU Science Department offered the second session of another two week SGU STEM Horse Camp on June 27th – July 7th for middle and high school youth. 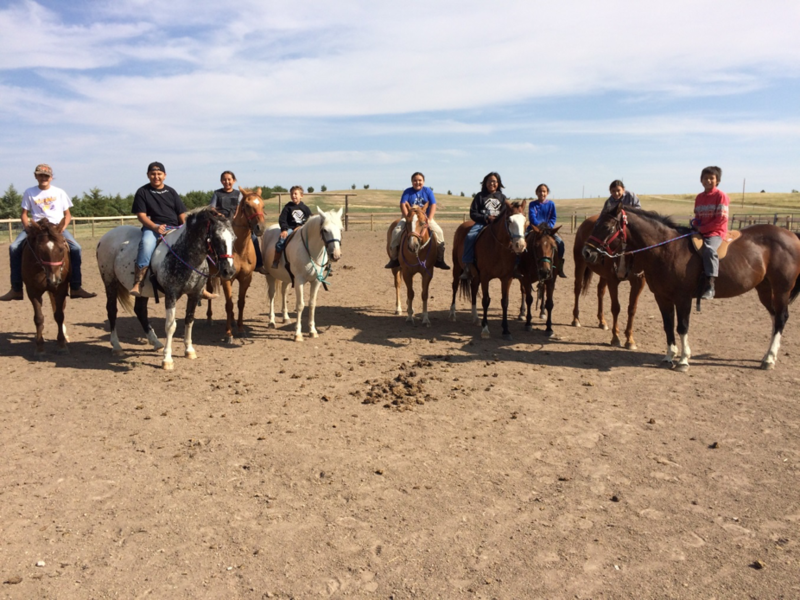 Throughout this two week camp, 14 students spent their mornings learning how to care for horses, how to ride and interacted culturally with our Sunka Wakan Oyate at the SGU Horse Ranch while also gaining knowledge and experience with Lakota values. White Buffalo Calf Woman Society offered transportation assistance and also “Expect Respect” sessions each day to prevent teen dating violence and promote safe and healthy relationships. Ron Frederick, 4-H Youth Program Advisor, SDSU, also assisted with teachings on safety, riding, health and care of the horses. In the afternoons, camp attendees headed to the SGU Tech building where they were introduced to the different fields of STEM:Science, Technology. Engineering, and Mathematics and designed and completed their own research projects. The end of the two week Stem Horse Handler Camp concluded with a horse riding exhibition, a cookout, and presentations of their research projects for family and relatives. For more information on these day camps held from 9 a.m. to 4 p.m., M-F, please contact: Kateri Douville at 605.856.8163 or Dave Valandra at 605.682.1823. Applications can be picked up at the TGKP office on the SGU Campus in Mission, SD or mailed to you by calling Kateri. As the number of children coming to the camps and other services is increasing, SGU Tiwahe Glu Kini Pi Horse Ranch is seeking donations or loan of “kid” Horses for the programs offered by TGKP. Some of our Sunka Wakan are getting older and are ready to retire. If you are interested in donating or loaning a horse, please contact Dave Valandra at 605-682-1823. We will feed and take good care of them. Must be broken and gentle. Pila maya. 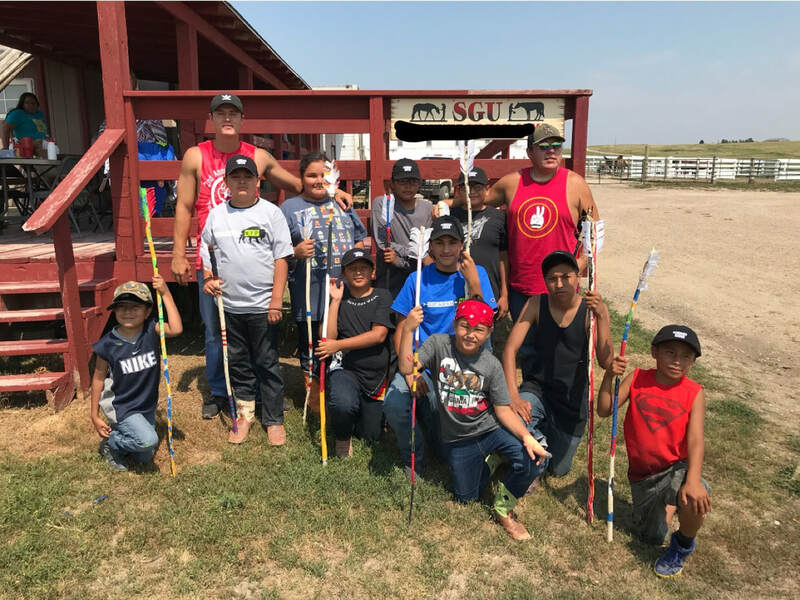 Another successful Sunka Wakan (Horse) camp ended this past week for SGU Tiwahe Glu Kini Pi “Bringing the Family Back to Life” at the SGU Horse Ranch. 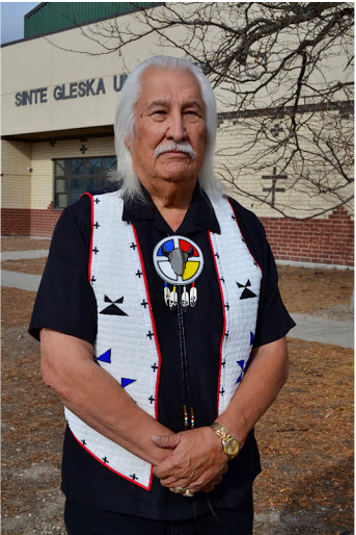 This week was for a group of young men, ages 8 – 12, who spent time connecting with the Sunka Wakan Oyate (Horse Nation) and learning about their care and safety from SDSU 4-H Instructor, Ron Frederick. Camp Coordinator, Aldo “Bear” Seoana, the TGKP Horse Handlers and staff kept the young men busy with outdoor activities and horse riding. Highlights of the camp included the young men painting their stories on horse effigies, long walks and storytelling ending with an Inipi (sweat) ceremony on Wednesday to enhance their Positive Cultural Experiences. The boy’s huge smiles coming back up to the ranch house from the Inipi was a true indication of how successful the Inipi and the overall camp experience was for them. The camp ended with a cookout with families, awarding of certificates, a group picture and as always requests for more time to ride horses! Sinte Gleska University is sponsoring a Free Horsemanship and Rodeo Clinic Program on August 22 & 23, 2017, from 4-9pm, at the RST Rodeo Arena in Rosebud, SD. For more info, contact Travis at 856-8100. 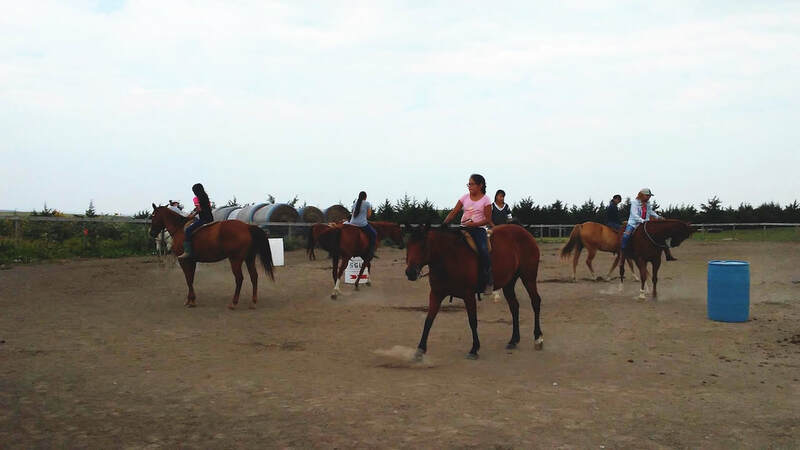 Mornings for the young women were spent at the ranch learning how to care for, respect and ride the Sunka Wakan. The Wicincila’s talked often amongst themselves about the spirit connection they felt with their Sunkan Wakan Relatives. In the afternoons the Wicincila’s were brought to “Our Happy Place” Sewing and Craft Recovery Room at the TGKP office on the Antelope Lake Campus where they were taught to use a sewing machine and picked out materials and ribbon colors to make their own ribbon skirts. It was a fun week with a lot of activities that taught the girls new skills, cultural competency and respect for others and all of creation, as well as respect for themselves. The camp ended with riding activities, a barbeque and fashion show of their skirts for staff and many family members who came to acknowledge the girls accomplishments. Wopila to Marilyn Parker, Billie Artichoker, Ron Frederick, WBCWS and the TGKP Horse Handlers who assisted Tiwahe Glu Kini Pi with the camp.